Both layouts have something in common. I bet you don’t know what it is! If you guessed Boutique, you’d be 100% correct! It isn’t as noticeable in the top layout as it is in the bottom layout, but it’s still there. Beautiful Friendship appears in both layouts, as well. Here’s the differences. In the top layout, I kept the color palette to sapphire, mink and bashful; the bottom layout features Sugarplum, our new color of the month (available soon!! ), pansy, sapphire, and black. There’s also much more Boutique in the lower layout than the upper one. The biggest difference is that I used some Heidi Swapp spray in the background. It’s been a lonnnng time since I used it, and I think I like the finished result. Maybe there’ll be more of it in the future? We’ll see. Even though I’m not here, you can still enjoy a layout I made. My little lady wasn’t a very happy camper here. It was wet and cold, and I think she’d had enough socializing for one afternoon! I picked up the yellows in M’s raincoat and carried it into the rest of my layout, as well as the pink. I began by creating a watercolor effect in the background. Next, I layered MME and Jillibean Soup patterned paper scraps ontop of the watercolor and on the right edge of the page. I stamped some of the embellishments with ctmh stamps and ink, and used punches to create the rest. Lastly, I journalled directly on the layout base, creating a border along the right edge of the page. This layout sketch by Laura Whitaker inspired my layout. Hi all, I’m back again today sharing another layout from our day spent at the airshow a few years ago. There was a lot to see and do there, which was great for keeping the little entertained. Emergency services was there, the local car dealership, various military vehicles and helicopters to visit. Lots of fun was to be had! 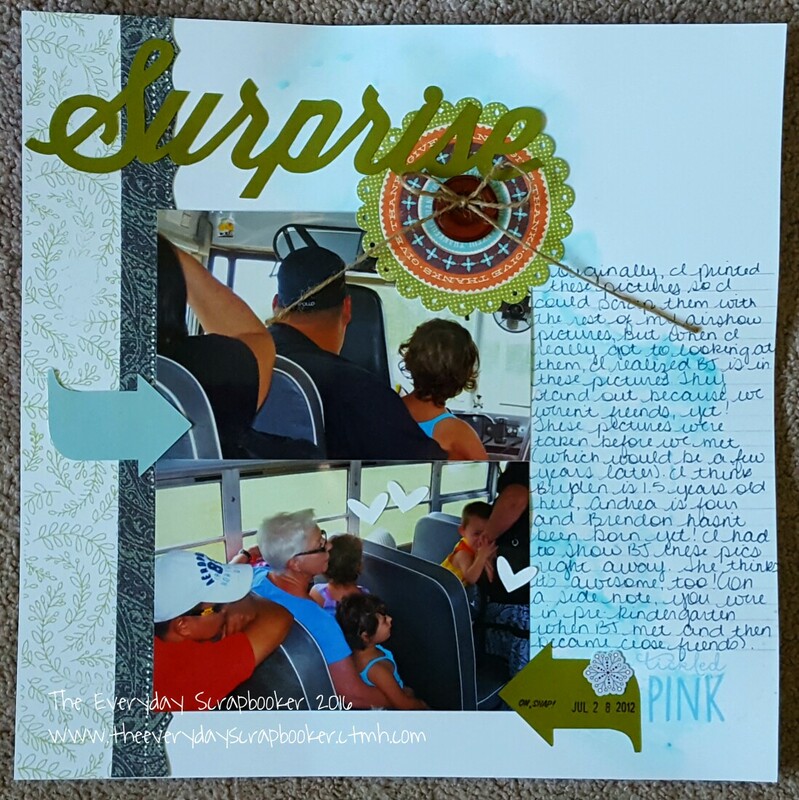 I began this layout with a watercolored background and some stamping. 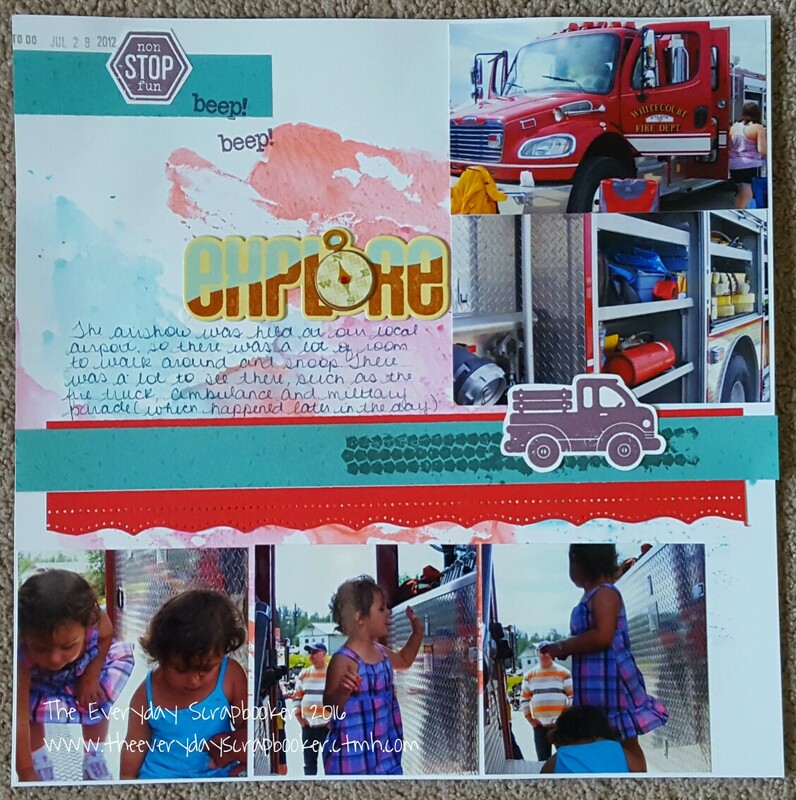 The cardstock and patterned paper strips are scraps and I stamped the adorable little truck on scrap cardstock, then fussy cut it out. I created my title using a sticker I held on to for way too long. It works really well here, though, so it’s a blessing in disguise! This layout sketch from Shimelle Laine was my inspiration. Good morning! How does a layout sound today? So, there’s a funny story behind this layout. At the time these pictures were taken, I didn’t know anyone on the bus with us- we were heading to the airshow in 2012. The only people I knew was my family, who was with me. When I sat down to scrap these pictures, I realized as I looked at them, that the woman’s arm in the top photo looked strangely familiar. So, I looked at the second picture, and realized the little boy looked like my friends’ son B. Since it was 2012, her youngest wouldn’t have been born yet (she was likely pregnant with him in these pictures), so it must have been a very young B (her middle child also has a name that starts with the letter B. Just so you’re not confused, lol). I sent her a screenshot of the two photos, and we both had a good laugh over it. She was in my pictures even before we became besties! (Proof showing we’re kindred spirits). The other little head in the same seat as hers is her eldest daughter, A. My mom and the toddler twins are in the seat directly behind hers in the bottom photo, and my husband and M are in the seat ahead of hers in the top photo). 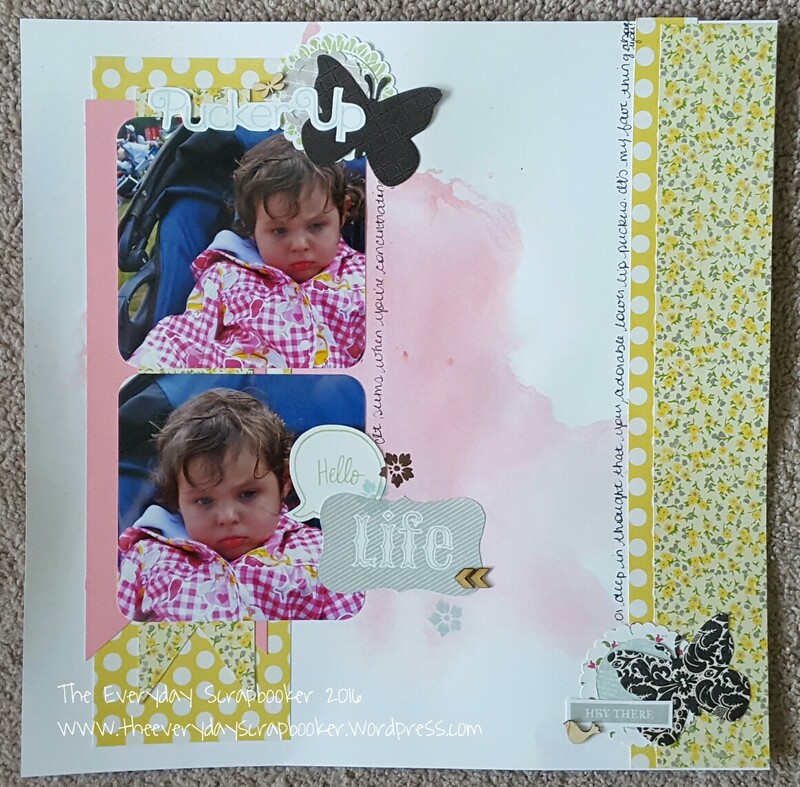 I created this layout by stamping the floral border along the lefthand side of the page using CTMH Pear ink. Next to it, I layered a 0.5 inch strip of patterned paper and layered the pictures next to that. I cut the title and arrows from scrap cardstock using my cricut, and adhered the title ontop of ephemera from Jillibean Soup. For extra flair, I adhered a button from my stash in the centre of the circle, and tied a small bow using scrap twine from my stash. To draw attention to the journaling, I watercolored the right hand portion of the page and wrote directly ontop of it once it was dry. 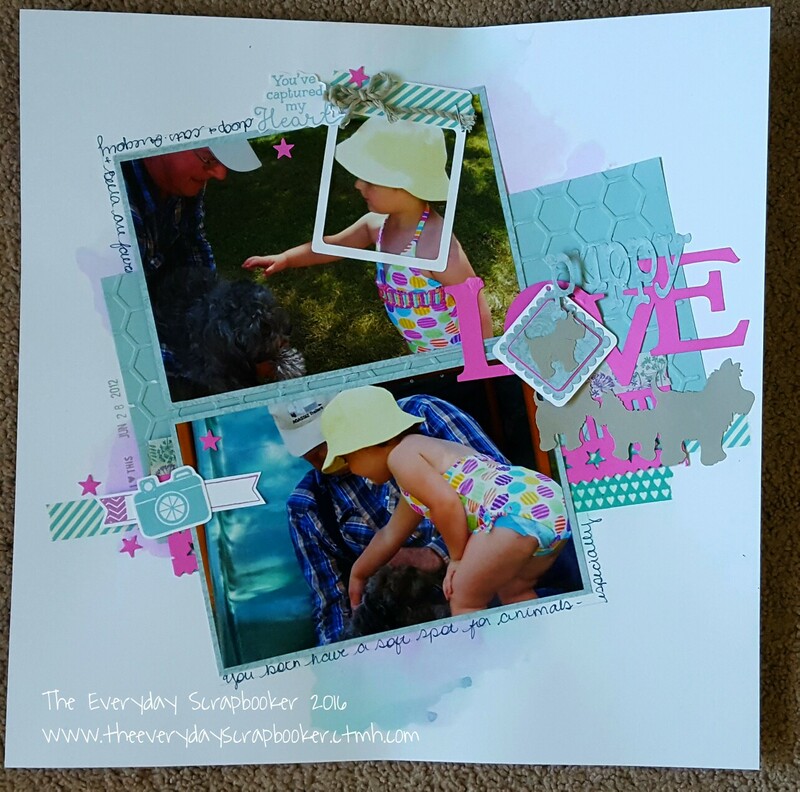 I added a few other stamped and stickers odds and ends to complete this layout. This sketch was my layout inspiration. Hello friends. Wednesday already. Crazy how fast time flies! I was talking on the phone with my husband yesterday, and I was astonished to learn I’ve had my current car for a whopping 4 years already. I had just begun looking at September, 2012 pictures as we talked, and the proof was in the first picture in my queue. I had to ask him if that was true! So, yes, time does fly. You’ll see a layout about Sassy (my car) in the near future- and who she replaced (Yuki, in case you were wondering). Today’s layout is a blast from the past, too. Miss A was two years old in the picture above; before we headed out to the Airshow, I caught this snapshot of her. (Hence the title, lol). I began by watercoloring the background and layering scrap patterned papers on top once it was dry. My heat tool helped speed up the drying process. I matted the picture onto more scrap paper, then added some washi and a bit of twine for a bit more flair. The title was cut with my cricut, and adhered on its side using my CTMH Liquid Glass. 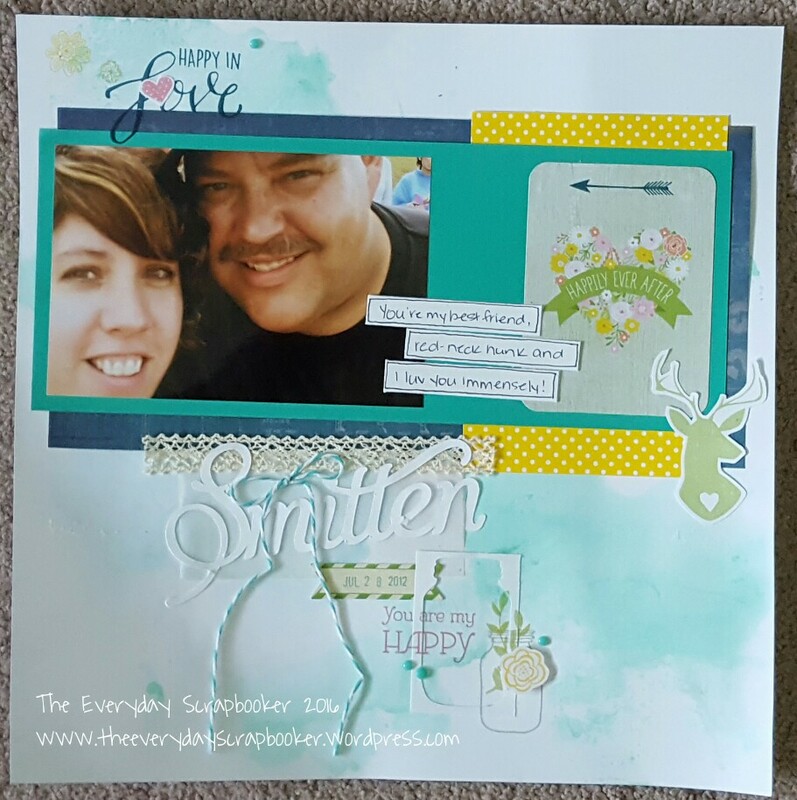 To complete this layout, I used random bits and pieces from Jillibean Soup and stamped and stamped and fussy cut everything else. I was inspired by this sketch. It’s another cool day, with more rain (possibly) forecasted, so the twinlets and I are laying low and just vegging today. 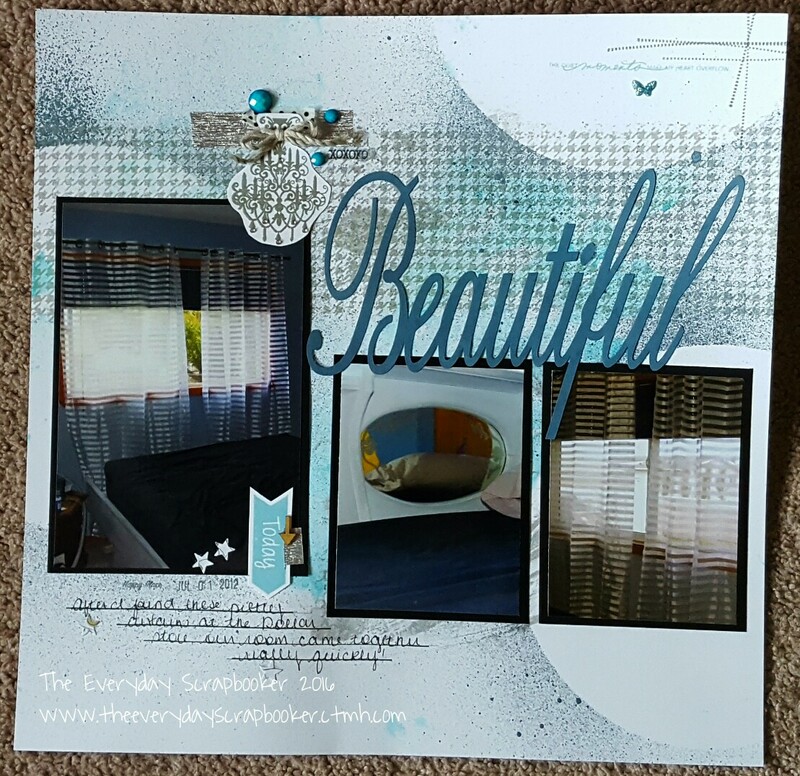 This layout is a companion to yesterday’s layout- in that it continues telling the story of putting the finishing touches on our bedroom- mainly, converting my husbands watered frame to fit our current non-waterbed mattress and box spring. Before the bed was reassembled, I hung curtains in our room too- which hadn’t been there before. I began this page with some blue water colors, then spritzed ink over circles that were randomly placed around the paper. Once it was dry, I stamped the hounds tooth background and layered matted photos over top. I cut the title with my cricut, and stamped then fussy cut some of the embellishments around the page. (Some elements were just stamped directly to the page). Lastly, I added some washi, puffy stickers, enamel dots and a couple wood veneer embellies to complete the page. I was inspired by this sketch by the Memory Nest. Happy Sunday, dear friends! 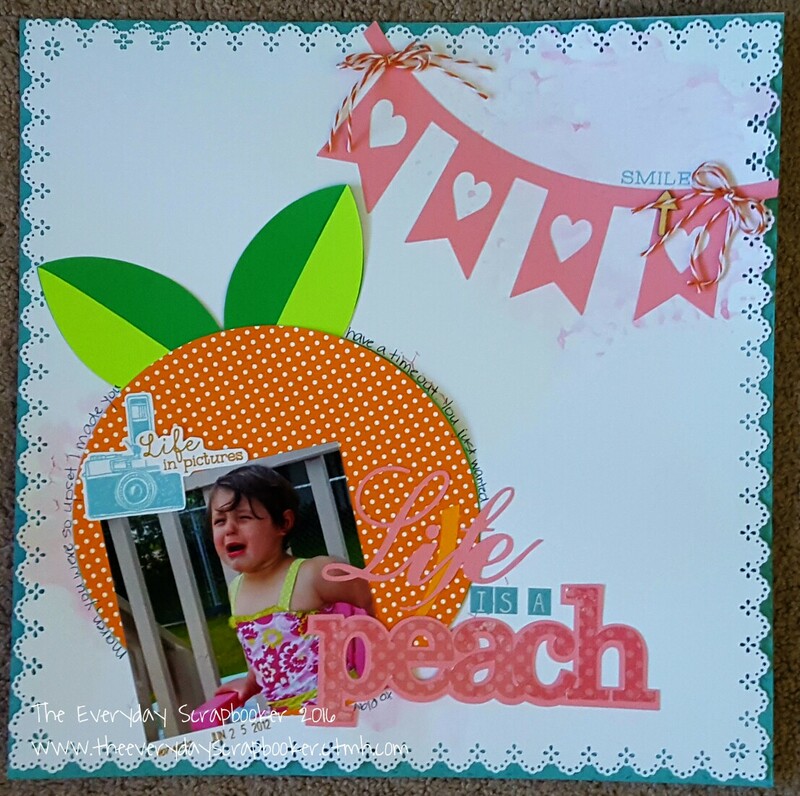 I have another layout to share today! I love the colors I chose here- the pop of Thistle (purple) against the Teal is gorgeous! I used a CTMH embossing folder for the background, then layered some washi tape and cricut die cuts on top. And, for good measure, I added some stamping and fussy cutting, as well. 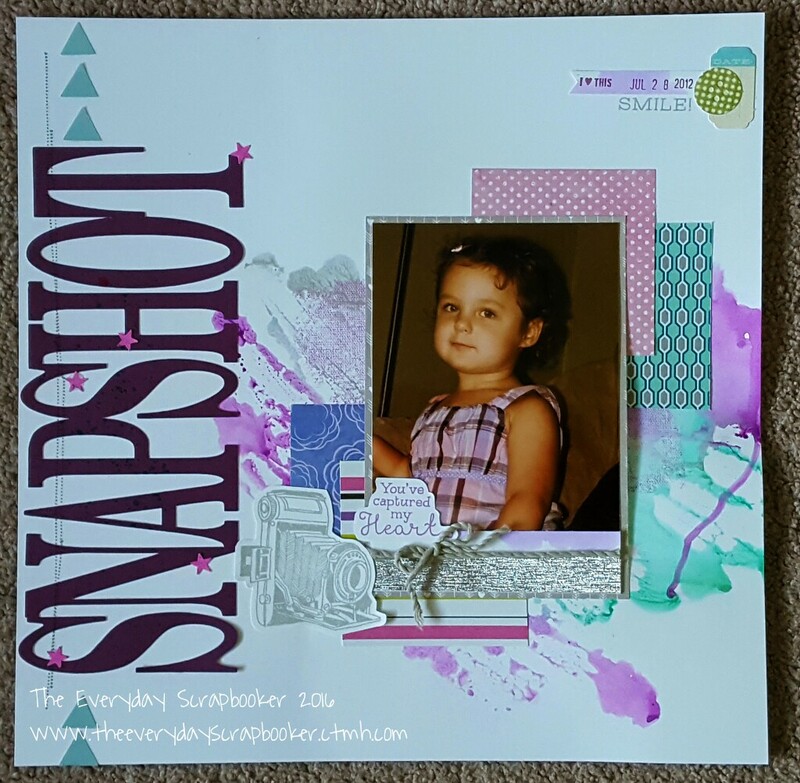 I was inspired by Creative Scrapbookers’ June sketch challenge. 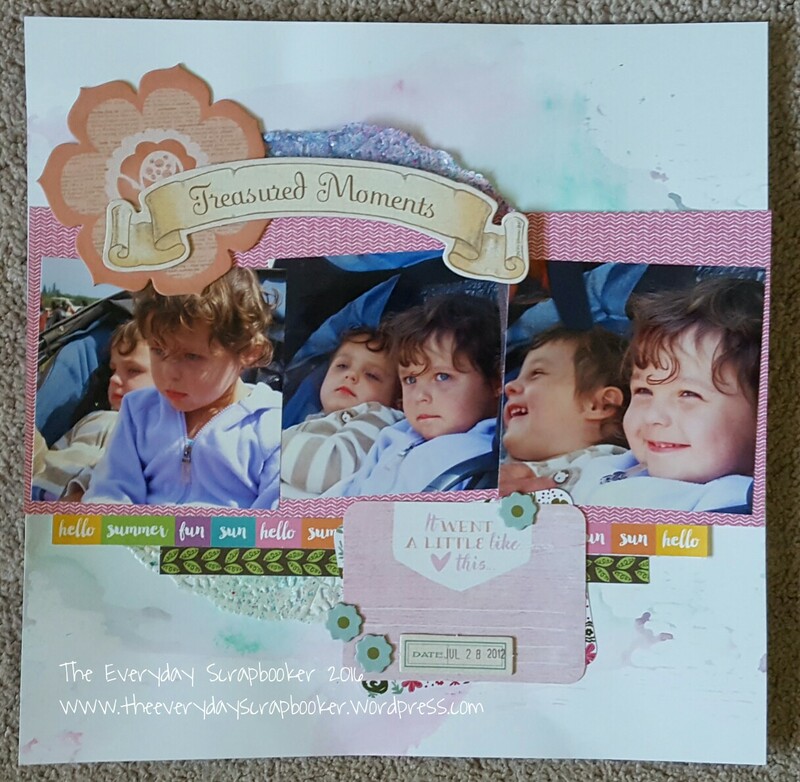 I created this lighthearted layout using a fabulous sketch from Laura Whitaker for Stuck?! Sketches. I began by watercoloring the background using Gelatos, abd punching aroynd the page by using a border punch. Then, I cut a large peach using my cricut and adhered it ontop of the watercolored layer. Next, I cut the banner and part of the title using my cricut, then added some sticker alphas and stamping from CTMH to complete this page.